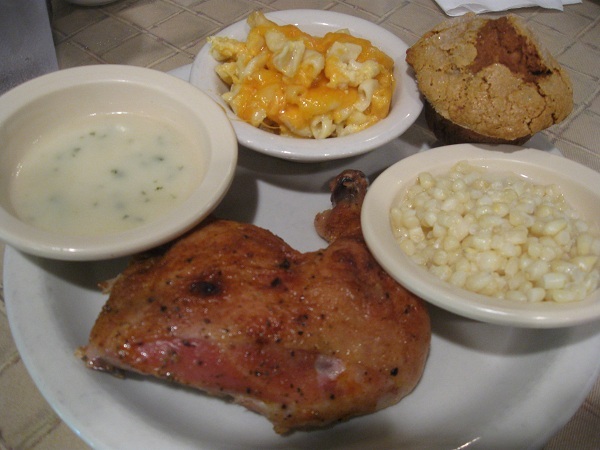 The 4th of May Cafe, St. Simons Island GA (CLOSED) – Marie, Let's Eat! This is Marie, writing because I took a trip without Grant. The young man and I went to see my folks and my brother on St. Simons Island for the 4th of July holiday. We had a great time and as usual on the island ate very well. The 4th of May is named after the birthdays of the founders of another place entirely, with the same name–this is a spin-off of a different sort of restaurant which doesn’t exist any more because some of the founders retired. It’s a neat little place that has changed a little as it got more business. Originally you could see over the counter where the desserts are stored to watch the cooks prepare your food, but now there is a wall (painted with pictures of vegetables) that has only a small window to pass the prepared food through. When I first started going there you could also buy loaves of bread to take away and make your own sandwiches. Since they started after I had left for college, I only did this once, and was disappointed when trying to take some with me on a following trip. Apparently they don’t sell loaves any more, although perhaps they still will if you know them. This may possibly have something to do with being popular enough to need what small loaf storage space they have for making the sandwiches people order for lunch. The sandwiches are very good. In fact, all the baked goods are excellent. Once I bought two portions of their blackberry cobbler to take home with me after a weekend trip because 5 hours is a bit long to drive to top off your dessert and I needed more than just the portion I’d had with dinner. On this particular visit, I had the Sunday lunch special. It was quite tasty, though I would have preferred to show you the picture of our son’s sandwich instead of my meal. Before he picked it up and dropped the contents on his plate, it was more photogenic than mine. The one disadvantage of his meal, though, was that he didn’t get the pumpkin muffin as a side. That’s almost as good as a meal by itself. My father and brother accompanied us and Karl, who arrived late, seemed perfectly satisfied with a small fruit bowl and a muffin as a snack. My father, who proclaims himself a “reluctant omnivore,” nevertheless tucked into his meal, which included as one of his sides the corn you see in my picture, with considerable fervor. Although there’s another place on the island that generally steals our breakfast business, if we were hobbits and inclined to second breakfasts in the same day, we’d have to alternate between them. Also, I need to figure out how to make those pumpkin muffins because, as with the cobbler, it’s a fairly long trip to get a snack. Posted on July 12, 2010 July 29, 2017 by Grant G.Posted in brunswick and the golden isles, casual american, georgia, goodbye, marie writesTagged brunswick, casual american, closed!, georgia, marie writes, saint simons island. Sorry to report that The 4th of May closed in May 2014. Reading this (I was looking for images of Mallery St.) and remembering 4th of May almost 5 years after they closed. Loved this café and ate many meals there while visiting St. Simons. Their veggie side dishes were second to none. All good things must come to an end, sadly many times too soon.